So, I finally decided on a business name and some of you have probably already guess what it is after seeing the title of my blog post. Thank you for all of the feedback I received after my earlier post ‘What’s in a name?’ it helped me develop more concrete thoughts about the next steps to take. The name I settled on is ‘Two Black Dogs Art & Photography’ which seemed logical because it has meaning to me, and it builds on my existing ‘brand’ (if you can call it that). I hope that the words ‘art’ and ‘photography’ provide enough information about me and people will explore my website or contact me through social media to get more detail about me and the type of work I do. For those of you reading this post my business focuses on creating pet portraits using the medium of pastels and/or photography. You may be wondering why the word ‘pet’ doesn’t feature in the business name, it is because I also paint landscapes and wildlife, photograph shelter dogs, and on the odd occasion I photograph people. My website is currently a portfolio, created using the Adobe Portfolio which is free to Adobe Creative Cloud subscribers. At the moment I have no pricing available and no way of booking online, my work comes through requests via email or direct from friends and family. Whilst I have years of management experience, having my own business is new to me and there is a lot to learn so I am taking things slowly while I find my feet. If you would like to see examples of my work, please take a look at my portfolio: https://www.twoblackdogsartandphotography.com.au and let me know what you think. The logo for Two Black Dogs Art and Photography was partly developed by a graphic designer and I then tweaked the typeface and layout a little to suit the various formats. Thankfully the designer is a friend who accepts gift cards as payment and he was happy for me to adapt the logo to suit, providing me with the source files that made it possible. This is going to be a steep learning curve for me, I will be trying to find more regular work in the interim as art and photography supplies don’t come cheap plus we have a senior dog to support 😉 If you want to follow my work you can find me on instagram @twoblackdoggiesartandphoto and I will try to share more on this blog, my posts have been rather infrequent these past 12-18 months. On that note I’d like to thank you all for your patience and your support, this blog has been going for about 8 years and I’ve (virtually) met some wonderful people as a result. Monday marked six weeks since we farewelled our dear old Maxi. Some days it feels as though it was only yesterday when I held her in my arms and said goodbye, her not being here doesn’t seem real. Other days I feel her presence, I close my eyes and she is right next to me. There has been plenty of tears, but also a lot of reminiscing about the funny side of life with Maxi. I miss hearing the click clack of her nails on our tile floor as she paced through the house, and come dinner time I picture her standing in the doorway eagerly awaiting her food. I miss the happy dance that she did once she realised dinner was ready and I watch with sadness as Bundy heads to the garage alone when I go to work. I wish I could kiss her forehead again and feel her soft ears in my hands, did she know how much I loved her. Yesterday the custom urn from Vitrified Studio arrived. After seeing their beautiful urns on the oh melvin (and yo jake) (and hey doug) blog and reading the recommendations I knew that nothing else would do for Maxi. Such a special and beautiful girl, she deserved something special to rest in. 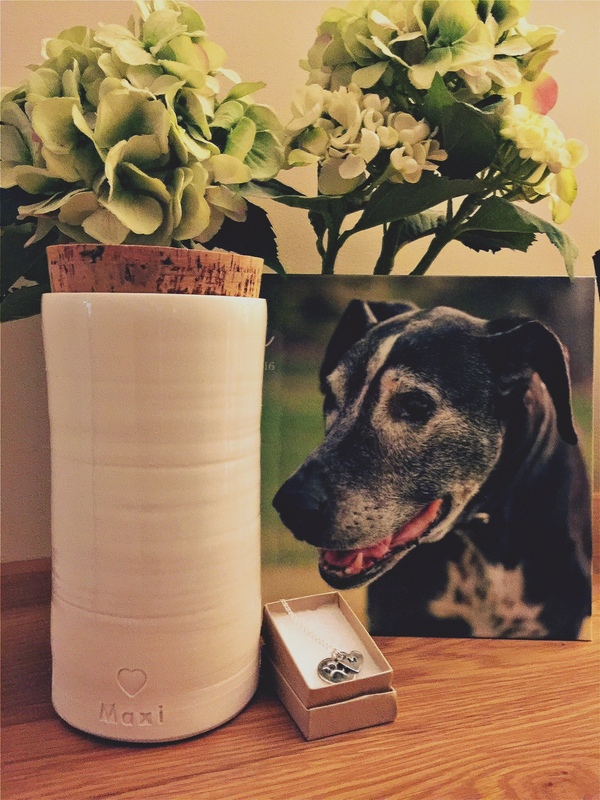 On the back of the urn the artist has stamped (at my request) ‘you had me at woof’, one of my favourite dog related sayings and the most meaningful. At the moment the urn is on display alongside the Maxi photobook I created after sorting through hard drives and boxes to find all the photos. It makes me smile to see her face, the photobook is filled with hundreds of photos taken throughout her life and each photo has a funny story or a special memory that comes rushing back when I browse through the pages. Also in the photo is the silver memorial necklace from Earth Shine Designs1, it arrived today and even though it comes from the other side of the world it makes me feel as though she will always be close when I wear it. Gone, but never forgotten. 15 years ago a little black doggy was born, we had no idea she even existed until we saw her big floppy ears and spotty chest in a local pet store. She was the last one left and although I know better than to support pet stores now, at that time in my life I just had to have her. We named that little puppy with the big ears Maxi, she spent her first few weeks hanging out with her gal pal Murray at my sister in-law’s house while we found a more suitable place to live. Maxi didn’t go to puppy school or obedience classes but we did call in a trainer to help us learn how to walk her properly because she had a tendency to pull and we knew nothing about training a dog. Many mistakes were made however Maxi’s nature was so sweet that she won the heart of everyone we knew, my Mum is particularly fond of her and would have been happy to make Maxi hers. Maxi was a high energy puppy and loved to play, this didn’t change as she grew into a large dog however her favourite thing to do was race around in huge puddles of water. When our local park was flooded, she would do zoomies through the water, mouth open and tail tucked under. Occasionally she would throw herself on the ground and do what we called her commando roll on the slippery, soggy ground. When she was bored or feeling the heat, Maxi would dig. She dug holes in the lawn, in the garden and in the sand at the beach. Maxi still digs, evidence sticks to her nose and her nails and in one corner of our yard there is a huge hole and it is getting bigger. Maxi is the ‘diggingest dog‘. Maxi as a puppy and chewing on her first bone. Our dear Maxi girl is now 15 years old, her face is almost all grey and her hearing isn’t great however she still loves her walks and tries to coax Bundy into playing with a stiff but meaningful play bow. Arthritis means the walks are short and even though she starts out strong, after 15 minutes the pace has slowed dramatically and Maxi is ready to take her place on her bed. As a geriatric dog, doggy dementia has become a reality. Maxi has a tendency to wander off halfway through her dinner and needs reminding to return to her bowl, leftovers are not something that our barrel shaped boy needs to indulge in. During the night, I hear her nails click-clacking on our tile floor as she paces through the house and when I get up to let her out she looks at me as if to say “What are you doing Mum? I don’t want to go outside”. She has a knack of knowing exactly when I get settled in bed, because that is when she actually wants to go outside and sometimes then she will walk out the door, turnaround and immediately want to come back inside. None of this is a major problem, Maxi’s vital signs are still good and since having a couple of bouts of pancreatitis she is on a strict diet which helps keep her weight down and in turn, make it easier for her arthritic legs. We are so happy that Maxi is still in our lives, she was our first fur kid and has been with me through many ups and downs. Maxi is the reason I became an obsessed crazy dog lady and proud dog Mum. At the moment she is sleeping soundly on her bed in her favourite spot near the front door, she likes the view from there and the slight breeze helps her stay cool. Happy Birthday my beautiful girl! Thank you for the unconditional love and the joy you have given me. Hard to believe that the year is almost over and that Christmas is looming. It has been such a busy year and so far the forecast for next year is not alot different, plenty to do and plenty of change. I love Christmas, I hate all of the rushing around and stress that it brings however all the worry tends to dissipate on Christmas Day when family and friends are together. My cousin N also loves Christmas, while I tend to be a bit of a minimalist N goes all out decorating her home and tree so when she came to stay recently a visit to the local Christmas Shop was a must. The Christmas Shop is more like a warehouse, baubles, trees and lights adorn every inch of space and if you’re after santa suits or elf costumes there are plenty to choose from as well. Being the crazy dog lady that I am, the reindeer antlers for Maxi and Bundy were the first things that landed in my shopping basket. You have to admit, as embarrassed as our two black dogs appear, they really do look cute and the photos will look great on our family Christmas card :-). Our two black dogs always get presents from Santa, I even bought them stockings to put the presents in although Maxi won’t be getting any delicious treats this year, the last thing we want is for her to end up in hospital again. It is too early to set up the Christmas tree, we always put it up on December 1st and then spend a weekend hanging up Christmas lights in our backyard. At the moment it is hard to imagine our yard decorated with lights, the heat and dry winds has turned our lawn brown and there are a few odd jobs around the house that are best done in the cool of the evening. I’ve always wondered what a white Christmas would be like, it certainly seems more festive when you see images of the Christmas markets in Europe and watch Christmas movies that are set in cooler climates. How do you prepare for the festive season? Do you inflict costumes on your pets and buy them presents? Last Friday was Take Your Dog to Work day, a fantastic initiative that celebrates the contribution that dogs make to us and society in general and also to encourage people to adopt from shelters and rescues. It is well known that having a pet can lower stress levels, blood pressure and improve activity levels so surely bringing them to work can assist with productivity and morale, providing you don’t have any dog haters in your office environment.